Alexandre Lacazette scored twice as Arsenal beat a youthful Paris Saint-Germain 5-1 in the International Champions Cup in Singapore on Saturday. 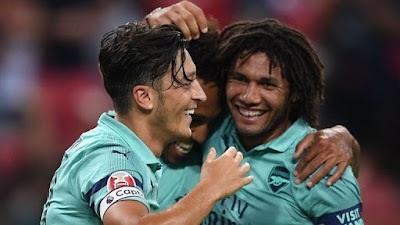 Mesut Ozil captained Arsenal on his first pre-season appearance and scored the opener after 13 minutes. The Gunners spurned chances to add to their lead and were pegged back when Christopher Nkunku converted a penalty on the hour mark for PSG, who were missing most of their first-team regulars. However, Arsenal finished with a flourish as substitute Lacazette scored twice in four minutes before late goals from Rob Holding and Eddie Nketiah.